Lotsa 'Splainin' 2 Do: Is the life expectancy of NFL players 55? Is the life expectancy of NFL players 55? Junior Seau, one of the greatest linebackers of his generation, died this month at age 43, an apparent suicide. Anyone dying at that age is far too soon, but in the public grieving period that followed, several people repeated the statistic that the average life expectancy of former NFL players is 55. This is a flat out falsehood. Life expectancies that low happen in the poorest countries on earth, places where any infection can be fatal and infant mortality rates are very high. In a country like Sierra Leone - average life expectancy 56.55 years the infant mortality rate is 76.67 death per 1,000 live births. Believe it or not, this is a vast improvement in less than a decade. For men who are old enough to play in the NFL, the infant mortality rate is obviously zero. Given the 312 deaths of former pro football players from Jan. 1, 2010 until today, the average age at death is 74 and the median age at death is 78. 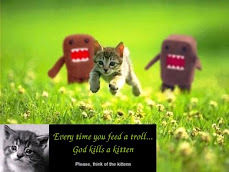 I do not report this fact to lord it over the people who read the 55 number some place and assumed it to be true. Let me explain my methodology. I took the data for the players from the excellent website Oldest Living Pro Football Players, which keeps tab on the obituaries of players, coaches, general managers and owners of pro football teams. I also grabbed 100 ages at death from the New York Times obituary lists from this year and last, excluding pro football players. The average for the 100 people on the list was 82.3 years. The standard deviation for the players' ages is 15.5 and for the other celebrities is 12.5. The t-score for significance was 5.43, which is crazy high. 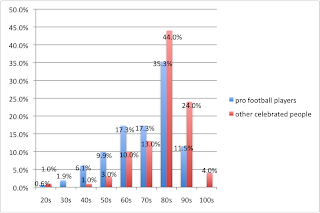 You can see from the graph above, with the football percentages in blue and the other celebrities percentages in red, that the vast majority of other celebrities made it to their 80th birthday (72%), while less than 50% of former pro football players made it to that age (46.8%). It can be correctly argued that this test has a big apples to oranges problem. 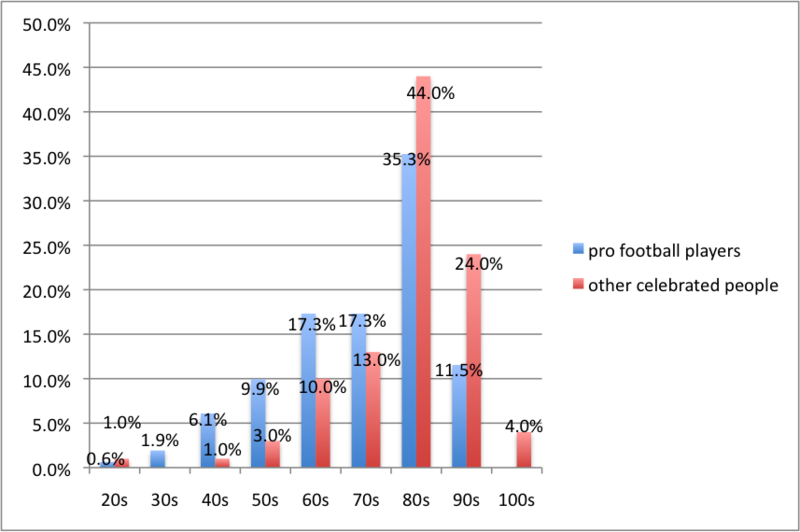 There is a steady increase in the number of people born each year, but pro football had very big jumps in the number of players when new leagues started or established leagues expanded, and some big drops when some unsuccessful leagues folded. For example, let's assume a pro football player begins his career somewhere between the ages of 22 and 25, assuming four years of college and possibly some military service. If someone is now 80, they began playing somewhere between 1954 and 1957. In this period, there are only 12 teams in the NFL and the most recent rival, the All-American Football Conference, packed up their tent in 1948, with their three most successful franchises - the Browns, the Colts and the 49ers - becoming NFL teams. For players who are now 70, they should have begun playing in the years 1964 to 1967, the era of the AFL and NFL. Those years started with 22 pro teams and jumped up to 27 by 1967, with one more in 1968. There are now 32 NFL teams, and there have been several leagues that have come and gone, including the WFL, the USFL, the XFL and the NFL Europe league, not to mention arena football and the unsuccessful attempted expansion of the Canadian Football League into under-appreciated U.S. cities. One way to lose this statistical noise is to take a sample of pro football players born in a given year and check their survival rates against the average American male. The Social Security system gives the national survival rates for males and females born in a certain year, and when checked that way, both baseball and football players do a better job of making it to 65 or 75 than the average American male born in the same year. So in conclusion, we have data that says the average pro football player is dying earlier than the average celebrated person, but that data is skewed by the fact that there are a lot more ex-football players 70 or younger than there are ex-football players older than that, percentages that are nothing like the general population. We also have data that pro athletes do a better job of surviving to 65 or 75 that the average American male born in the same year. What we don't have is data that can be spun in any possible way to tell us the average life expectancy of a pro football player is 55. That number is pure nonsense and needs to go away. The best writer with no sense of humor. A review of Atlas Shrugged - Part 1. The tallest midgets in Texas, 2012 edition.